Our company prides itself on providing the highest level of service possible. In order to do this, we build in the time to do a proper cleaning. Below are some options we have put together depending on your needs. Just like your local car wash, we now offer three options: basic, deluxe and premium packages. Each one comes with our hassle free guarantee. 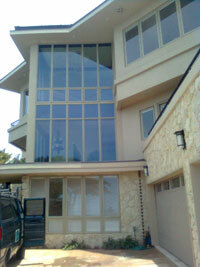 The basic window cleaning package includes washing all of your windows on the exterior only, including your screens. Many choose this package as a maintenance package for 3 or 4 cleanings during the year after the first cleaning. Our best seller. The deluxe package includes washing the windows on the interior and exterior, deep screen cleaning, detailed track cleaning, frame cleaning and window sill cleaning. The most extensive house cleaning package we offer includes soft washing the exterior siding of your home with soapy water in addition to cleaning the windows on the inside and outside, sills, tracks and screens included.